94. 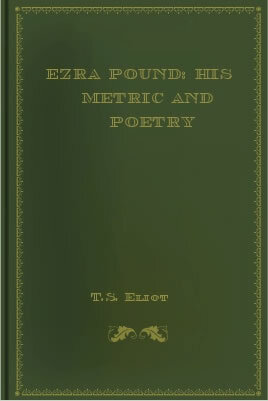 Eliot, T. S. Ezra Pound: His Metric and Poetry. New York: Knopf, 1918. Eliot admires Pound’s work with the nô, but it is ‘not so important’ as his work with Chinese poetry: ‘the attitude is less usual to us; the work is not so solid, [or] so firm’; Cathay (15), Eliot believes will ‘rank with the “Sea-Farer” in the future among Mr. Pound’s original work’, but the nô ‘will rank among his translations’, for ‘it is rather a dessert’ after the Chinese poems. Reprinted in Eliot’s To Criticize the Critic and Other Writings (London: Faber & Faber, 1965).